The garden is in full harvest mode, so what energy I have is going there. Haven’t had time to work this site theme or any other Word Press projects right now. And we canned up 7 pints. We used the cold pack – 60 min water bath method. Russel also made some fresh tomato sauce, which was so good, I am tempted to harvest and or buy more tomatos and can up some pints of that. We have also eaten corn (so sweet and fresh), we have eggplant almost ready, and the peppers are really turning red. Cukes and squash are still producing, as is the salad bed. I love eating fresh organic food.. makes all the work worth it! 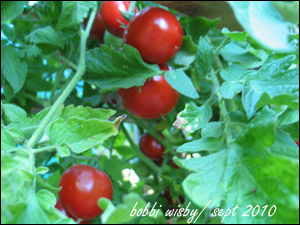 Your tomatoes on the vine and in the jar look delicious! I’d like to see your instructions for the 60 minute water bath method. 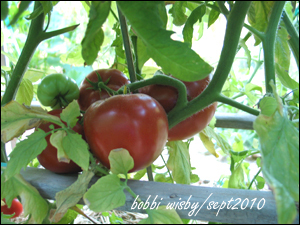 Here is what I made up with our greenhouse tomatoes yesterday. 1. Stir the tomatoes, green bell pepper, onion, cilantro, lime juice, jalapeno pepper, cumin, salt, and pepper in a bowl. Serve. There are so many instructions on the web, I followed those. I cut my tomatoes in quarters mostly, and squeeze out a lot of the juice and fish most of the seed out with fingers. Meanwhile you have your jars sterilizing in hot boiling water. And you have your water bath canner almost to a boil about 1/2 full. Put cold tomato into hot jar and mash down and release bubbles, if needed add a smidgen of boiling water to 1/2 inch head space. Wipe the rim, put on lid and screw top. Transfer to canner with jar lifter. When canner is filled with jars, add boiling water to cover jars at least 1″ and boil for an hour. I also added (first time this year) 1/4 t of citric acid per jar. 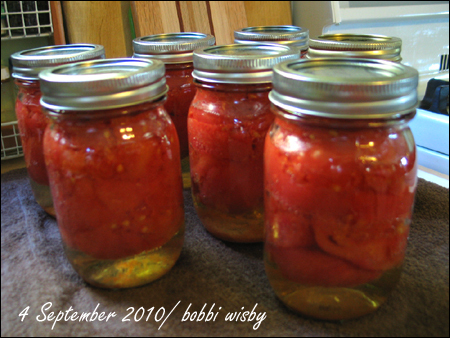 You need about* 15 pounds of unprocessed tomatoes to make 7 pints. Your salsa sounds yummy. I think I will get ingredients for that when in town next time!